At Fuller’s we pride ourselves in brewing exceptional beer so it is important that our glassware presents our beer in the best way possible. Our Quality Manager, Emma Watts, tells us why the glass we pour your pint into matters almost as much as the beer itself. As interest in beer and its character is growing, people want to be able to fully appreciate the work put in by the brewers. That’s why there are a huge variety shapes and sizes of beer glass behind the bar. Our senses play a huge part in our experience of a pint of beer including what we see, smell, taste and hear, so the glass needs to deliver on all those senses! The right glass should enhance and exhibit all the care and attention that the brewers and the pubs give to our beers. 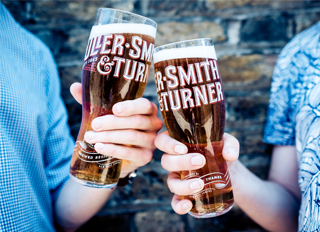 Our new glasses are elegant, easy to hold and proudly representing our heritage, whether they are the half or pint version. It’s that final step in to get a pint that delivers the flavours our brewers have created, ensure our beers present themselves well, and promotes our heritage and brands. Which Glass For Which Beer? We have worked hard to develop our glassware to suit the styles of beer that we brew. Glasses need to generate the right amount of head to allow the flavour components of the beer to be released and to enhance your experience of that beer. The traditional pint glass and jug are ideal for drinking and toasting your pint of cask London Pride with friends. However, our new keg glass for our craft range has been developed through a process of collaboration with our brewers, our pub teams and our customers. The tall shape, not too tall mind, means you can truly appreciate the colour range from the malt that we put into our beers. The nucleation on the base ensures the perfect amount of bubbles to enhance the hop and yeast flavours and maintain the head without losing its character. Our chief tasters here at the brewery sampled a number of our products in a variety of glasses to give their final seal of approval. The perfect pint must be served in a clean, cool, glass. We’ve spent time developing a unique procedure for clean glassware, which is why Cask Marque considers our managed estate is the benchmark in terms of glassware quality. Once you have your clean glass, it has to be cool and dry. When ready to pour, angle the glass to the tap at 45C. Ensure the nozzle does not touch the glass or the beer. As the beer pours into the glass, gradually straighten the glass, until full. You can learn more about our delicious range of beers here, and even buy Fuller's glassware from our online shop.